If you’ve ever try Googling this hybrid, it’s more likely you’d find hits under its old name, ‘Rhynchocentrum Lilac Blossom’ before the genus Rhynchocentrum was fashionably renamed to Vandachostylis. Well, my Vandachostylis Lilac Blossom couldn’t care less about the name change and decides to send out two bright magenta spikes! Vandachostylis Lilac Blossom – an unexpected flowering. To be honest, I didn’t have high hopes on ever seeing this little fella in flower. 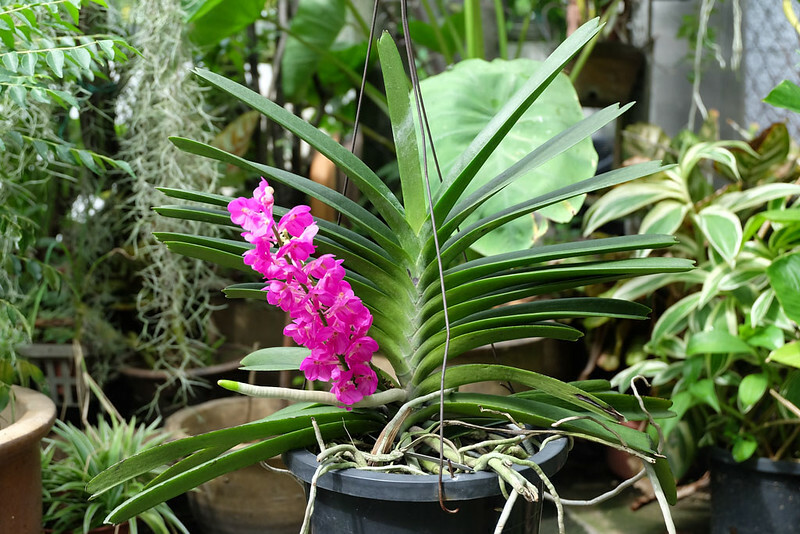 Both its parents, Rhynchostylis coelestis and Vanda ampullacea are notorious seasonal bloomers originating from Thailand and Indochina. Perhaps the skewed weather patterns here (I’m seeing more of it these days) have tricked it into blossoming. The flowers of Vandachostylis Lilac Blossom are not easy to photograph. The colour is difficult to match. I had to dial-up the magenta and pinks to really bring out the intensity of the flowers. What you see here are as accurate as I could get. Quite tough to get the colours right for this little fella. 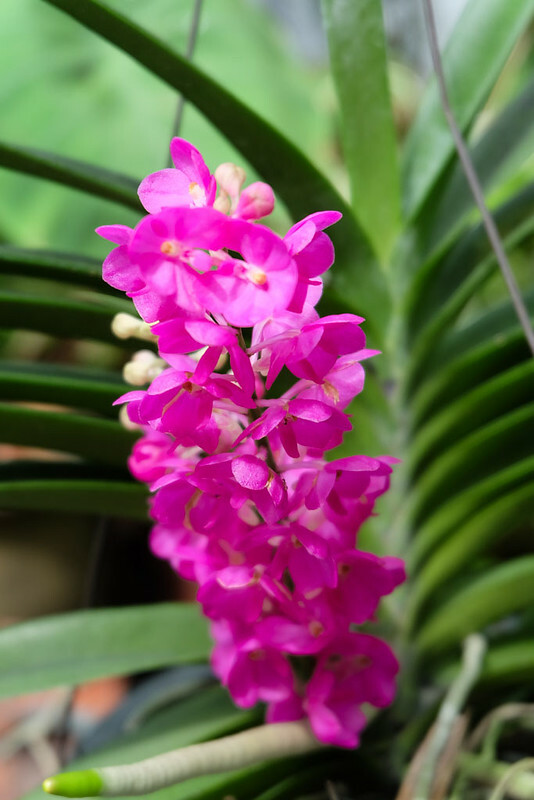 Vandachostylis Lilac Blossom is pretty easy to grow under standard conditions for strap-leaf vandas: bright but indirect sunlight, loose, chunky media, and daily watering under hot conditions. I fertilise this weekly at half to quarter strength of the fertiliser’s label recommendation. 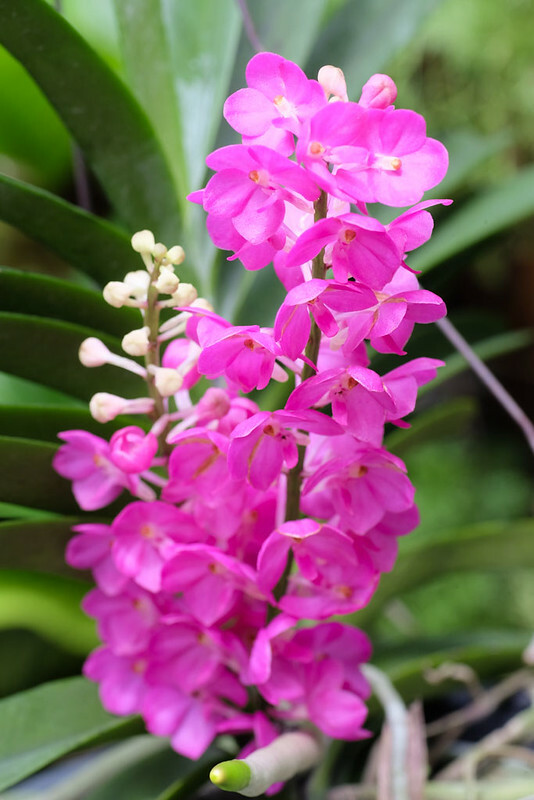 Vandachostylis Lilac Blossom is a compact vanda, which makes it great for small spaces.